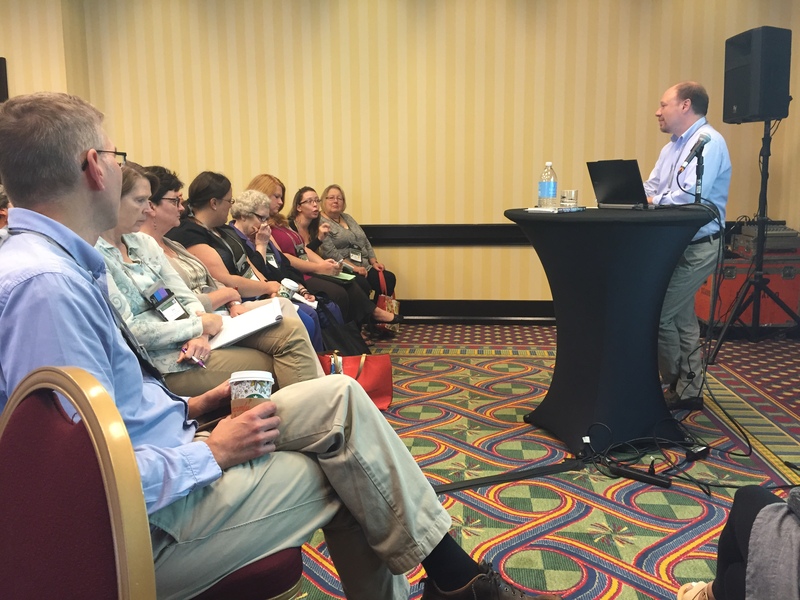 Tim Grove facilitating a lively conversation about historical thinking at the AASLH Annual Meeting in 2015. The annual meeting of the American Association for State and Local History always offers a good mix of educational sessions, social events, and opportunities to visit museums and historic sites around the country. This year, Sam Wineburg, a Stanford University professor and author of Historical Thinking and Other Unnatural Acts (2001), prompted an ongoing discussion with his plenary address on the first day of the annual meeting. Through his research on students and scholars, he showed that the analysis of historical documents is a sophisticated skill that isn’t apparent to most people (and I can confidently say this also applies to objects, buildings, and landscapes). He went on to argue that teaching people to think historically isn’t about teaching history but making them better citizens. John Dichtl, president of AASLH, discusses this further on the AASLH blog. Historical thinking: multiple perspectives; analysis of sources; context; and based on evidence. Are we underestimating visitors if we don’t give them oppty to debate ideas & issues at museums/historic sites? Debates always happen, but history gets flattened over time. Build multiple perspectives, uncertainty, & questions into exhibits. Asking good provocative questions is a skill. Learn more at the Right Question Institute. Challenge for marketing & communications staff about handling provocative topics in social media era. Are museums & sites imposing their ideology on visitors? Have we become arrogant? Do we need to learn about visitor interests? which resulted in 31 favorites and 20 retweets. Just to be clear, these ideas didn’t come from me but from the persons gathered in the room. I could have tweeted out many more but I couldn’t listen and type them out quickly at the same time. If you weren’t able to attend, there’s next year in Detroit. In the meantime, enjoy these snaps from the recent meeting in Louisville (and thanks to everyone at the Kentucky Historical Society for being such gracious hosts). This entry was posted in Collections, Community engagement, Historical interpretation, History, Leaders in the field and tagged American Association for State and Local History, Historical Thinking, John Dichtl, Kentucky, Sam Wineburg, Tim Grove on September 22, 2015 by Max van Balgooy.